Boil beets for 40 minutes. Remove from water and peel them. Set aside. Place lettuce leaves on a large serving platter. Cut beets into 1/4 inch rounds. Place the rounds of beets on the lettuce leaves. Cut apples into half moon slices. Place them on the beets. Place mandarin oranges on top. 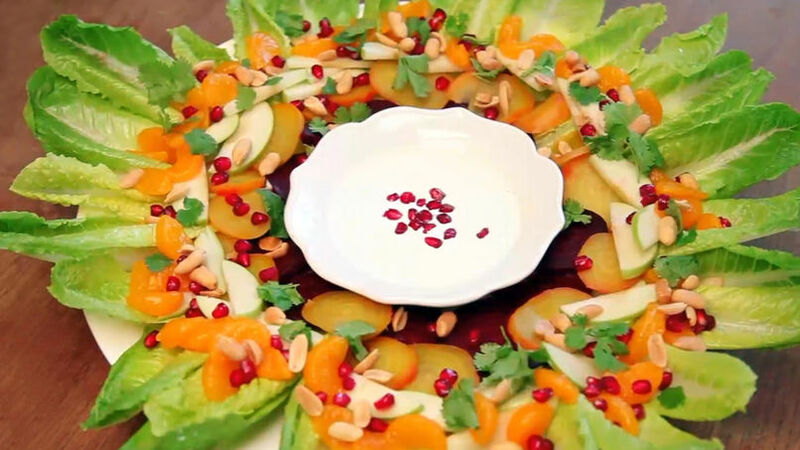 Dress the salad in pomegranate seeds. Reserve a few for the dressing. Toss peanuts over entire salad. Make the dressing with sugar, orange juice and vanilla. Add in crema and mix. Top with remaining pomegranate seeds.